This extensive range of collapsible backgrounds gives photographers the colors and patterns to express their creativity. Folds to one third original size. Varying sizes from solo portraits to small groups. Box Dimensions (LxWxH) 32.0 x 32.0 x 4.5"
6X7' Collapsible Background - Black/White is rated 2.0 out of 5 by 3. Rated 1 out of 5 by Kelly from Misrepresented This product is misrepresented both by the picture and features/product description. No where on this description does it say it actually comes in 3 pieces, one is the collapsible disk that has velcro around the top and sides, the other two are large lengths of white and black fabric. You actually have to attach the fabric to the front side of the collapsible disc. It is not already put together as it looks in the picture. When I did attach the material, it made the collapsible disc lopsided and did not fit correctly. Secondly, the picture misrepresents this product because there is only velcro on one side of it and it is NOT possible to have a black fabric train on one side and a white fabric train on the other. You can't just flip it around as it looks. You have to take the time to un-velcro one material to velcro the other color on. Rated 4 out of 5 by Anonymous from 6x7 Lastolite with Train Easy to use. 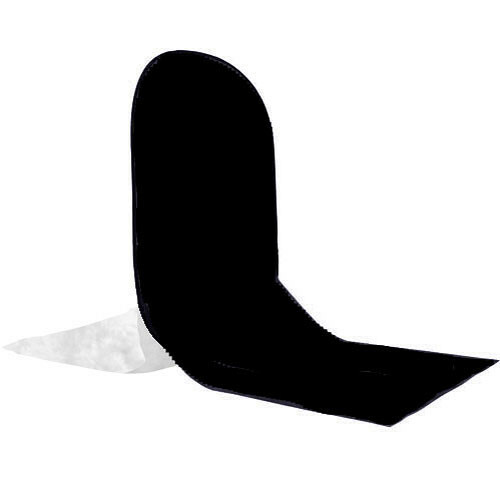 If I were to change anything about this product I would like Lastolite to add velcro to BOTH sides of the flex out frame so that both the black and the white fabrics could be on the frame at the same time. The picture is NOT accurate, there is only velcro on one side so you can only have one color on the frame at a time. -you cannot easily flip the frame around to shoot on the other side, you must take off the white fabric and then put on the black. Excellant product for on location shoots that require one colored background- but kind of a pain to have to change out the colors. I like the fact that they are detachable so that they can be washed, but I wish the train was longer. It is only about 3-4 feet long. Rated 1 out of 5 by Don S. from Poor Design - Defective Product Our studio purchased this product for on-location temporary studio use. It seemed like a good fit for our needs. However, due to what is apparently a poor or defective design, we have purchased/exchanged four of these backdrops. Each one had the same identical issue. The problem pertains to the frame and its inability to open properly. Instead of opening flat, the frame creates a bowed shape when open. As such, intended use of the backdrop doesn't work. Lastolite suggested we watch one of their videos for correcting the problem. (Twisting and folding the frame to resolve.) We did and it didn't. After contacting Lastolite/Manfrotto several times we were informed that Lastolite acknowledged the backdrop's problem and suggested we wait to replace (the third one) until the design issue had been resolved and new versions were available. After over two months we were told that the issue was resolved and the new backdrops were ready. We received backdrop #4 and were amazed to again see the same problem! Despite the problems, when we requested an RMA (for #4) from B & H to return and refund the purchase we were told the allowable return time had expired. Insult to injury..... UNLESS YOU WANT TO EXPERIENCE THE SAME PROBLEMS AND FRUSTRATIONS.... DO NOT PURCHASE THIS BACKDROP.